The harness at view is made to fit a LT1 (Impala/Caprice/Camaro) the computer mounts in the right hand front fender, passenger side.The transmission on this application is the 4L60E. 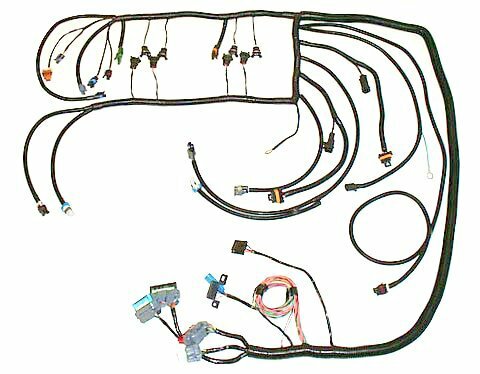 Components included: fuel pump relay, ALDL connector, Ho2 connectors, Tach pigtail, VSS pigtail. Any harness can be made to operate a full or no emissions engine. The main reason not to run with full emissions is simple, if the vehicle is below 1974(California) forget about it. We have computer programs available that allow you the freedom to run a no emissions engine. If you remove the emissions you will gain longer engine life in the process. 1994-1997 LT1 MAFS ( 96 the last year for the Vette) F-Body last year was 1997 LT1 fuel Injection. With all of the above being the same, the addition of a faster Intel based, “Flash” computer processor and the Mass Air Flow Sensor (MAFS). The final adaptation of old theory was erased once the Multi Port Fuel Injection became Sequential Port Multi Fuel Injection (SPMFI). Throughout the next 3 to 4 years the distributor went from non-vented to vented in 1995, with three different timing cover designs and three different distributors from 1992-1997. Speed Scene Wiring can help you acquire the parts you need based on your info. In 1996-97, F-Body the LT1 fuel injection system gained another Hall Effect sensor, known as the Crank Shaft Sensor (CKP). This sensor would just make timing even more precise, which relates to more horse power and better fuel economy / controls. In 1996 the operating system went from ODBI (On Board Diagnostic One) to OBDII (On Board Diagnostic Two). These are the standards, before global organization and federal control for all manufacturers. And after total federal control, with standard of communicating language for all cars in the US. OBDIII soon to come will be big brother, this system will notify you with a set amount of time to fix the manufacturer related problem. If you are not compliant you may find your vehicle or yourself in violation of federal laws / code. The 1996-97 fuel injected LT1 went from 2 heated o2 sensor, to 4 heated O2 sensors, 2 pre heated and two posts heated sensors. In the 1994 Corvette the introduction of the 4L60E transmission was a success, this transmission is basically a 700R4/ 4L60) with an electronically controlled solenoid valve body.